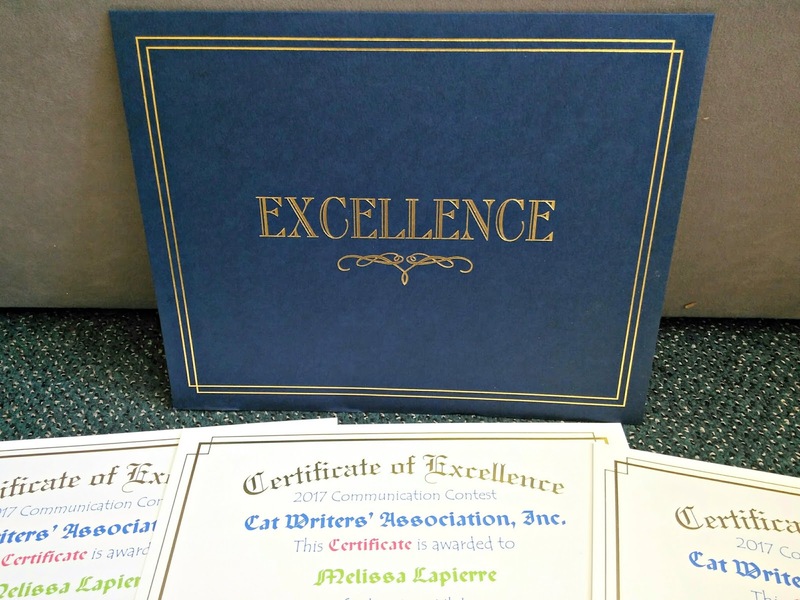 It was November 2013 that I was accepted as a Professional Member of the Cat Writers' Association, and I wrote then that it was a dream come true. I still have a file folder in my desk filled with articles I printed out from the CWA website dated 2006. 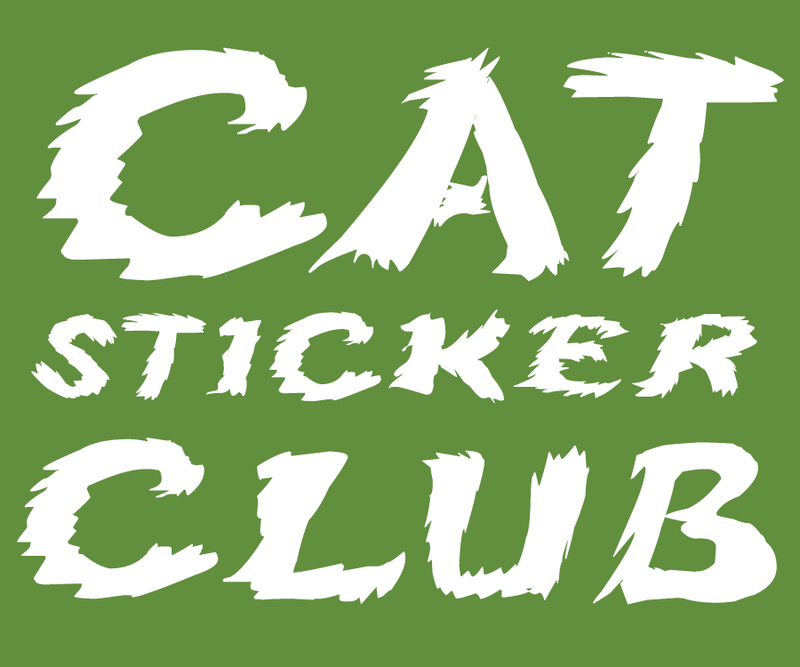 Back then I studied the membership requirements and made a vow to myself that one day I would become a member of this exclusive group of cat writers. 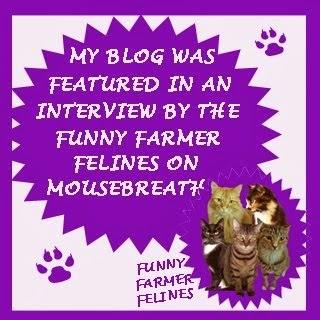 It took me another 5 years to start blogging, and even more time after that before I realized my true blogging passion was cats. What else could it possibly be? Even after being honored with a membership, the idea of ever winning a coveted Muse Medallion was so far in the back of my mind it was practically non-existent. I still had much work to do on honing my craft. Still, you'll never know if you can achieve something unless you try, so with the knowledge that Truffles' tragic passing inspired some of the best writing I'd ever done, in 2016 I decided to dip my toe into the water and enter their annual writing competition. Entries in each category are reviewed and judged independently by three professional CWA members and their scores are averaged by the Contest Chair to determine the winner. Anyone earning an average of 90 or higher based on the scores submitted by the three judges receives a Certificate of Excellence, with the highest score winning the Muse Medallion. I entered the Blog/Any Other Topic category, and not only won a Certificate of Excellence, but also the Muse Medallion...on my very first try!!! Last year I entered our blog again and didn't earn a Certificate. I was disappointed, but it made me all the more determined to work harder and write better. This is my favorite thing I've written since Truffles' Remember Me post. The idea popped into my head and the story just poured out of me, then I spent about 3 weeks perfecting it. I cried while I wrote it, and I still cry re-reading it. I don't think of myself as a very prolific short story writer (yet) so I'm tremendously honored to be a contender in this category. In the months since writing this I've had so many people tell me that they've saved it and used it to ask their vet about their own pet's vaccine protocol. As pet blogger, that's music to my ears, even though I wish we hadn't had to go through the experience in order to write about it. Torties just don't get the love or attention that they deserve (in my opinion), so any chance I get to use my platform to tell the world how amazing they are I'm going to take! 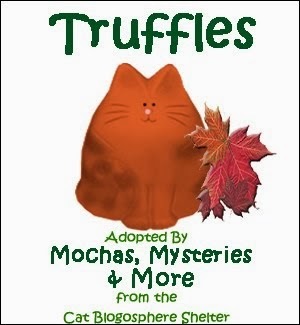 This one is special because it's the rare sponsored post where I wrote in Mudpie's voice. This Certificate is hers! 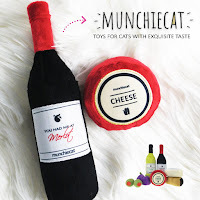 I've had so much fun researching and writing these Purrfect 10 posts, and my list of future topics to cover just keeps growing and growing. I like to think I know a lot about cats, but when you're passionate about something you're always eager to learn more, and that's what happens with every topic I choose. Muse Medallions will be given out at the Cat Writers Conference in Houston in June. I'm certainly not planning to win any because the competition is stiff, but just being a contender is an incredible honor! A big congratulations to you! 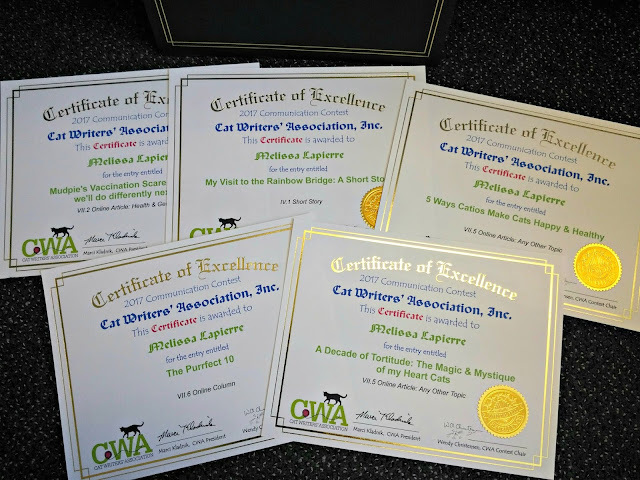 Your Certificates of Excellence are so well-deserved! Paws crossed that at least some of them turn into Muses! WOW! Congratulations!! That is really great. We are happy to say we enjoy your posts and find them entertaining and informative. Congratulations! You and Mudpie make a great team! Congratulations on all your Certificates of Excellence. They are SO well deserved. 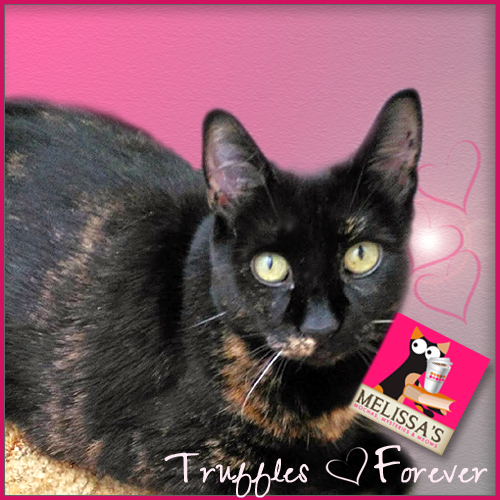 A huge congratulations to you and Mudpie, Melissa! You more than deserve every single one of these awards. I always look forward to visiting your blog, because your writing and content are true gems. Congratulations! Well done, Mudpie and Melissa! 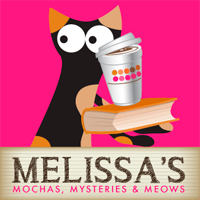 That is awesome mews, er, news! Congrats you deserve it and if anyone deserves a muse medallion it's you and Mudpie! We are so happy for you. We wish we could've seen your face when you opened your email and saw that you were getting all those certificates. Our favorite is still your My visit to the Rainbow Bridge post. Just thinking about seeing all the little ones we have in our lives. Just to see them again, and for them to show us all their new friends. It's incredible to think about. Keep winning those awards. Have a great day. Congratulations ... and well deserved! I want to meet you and Mudpie so much - I really wish you were coming to the Conference. That loud cheer you hear? That'll be us leading your cheering section! Congratulations on these well deserved certificates of excellence. Congratulations! What an awesome achievement. Congratulations! Your posts are always so great and informative. I just joined as a Professional Member a couple months ago. I'm excited to learn more about the organization! Concatulations to you! We're so proud to be in an organization with talented writers like you. Very well deserved, that's for sure. HUGE Concatulations to you on your well-deserved honor!!!!!! Well done YOU!! That is so awesome! Congratulations on your well-deserved certificates of excellence. We have our paws crossed that some of them turn into medallions!